Nearly a year after Drone Bees completed its purchase of Enaeria Inc., both will be phased out and replaced with Drone Services Canada Inc.
New Logo for Drone Services Canada Inc.
Enaeria Inc. was originally developed by a partnership of Daniel Matzeg and Zachary Feld, providing high quality RPAS surveying and inspections in Ontario. After being acquired by Drone Bees, a company specializing in aerial photography and videography, it was time to create a brand that better reflected the newly combined company. The CTO of Enaeria / Drone Bees, Eric Papky, said that the company had been planning this name change along with other major strategy changes, including an increase of available services and a focus on new technologies that complement the industry. The company provides RPAS based solutions in Ontario, and soon the rest of Canada. 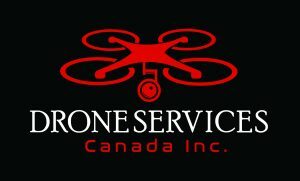 Asked about the business name change, the president of Enaeria / Drone Bees, Michael Brown, shared that this rebranding solidified the future image of RPAS services to the Canadian market. Drone Services Canada Inc. has been awarded a standing Special Flight Operations Certificate from Transport Canada for operations in controlled airspace, day or night. Organization: Drone Services Canada Inc.